The Primal Plant is going to be the strangest creature in the world, which Nature herself shall envy me. With this model and the key to it, it will be possible to go on forever inventing plants and know that their existence is logical; that is to say, if they do not actually exist, they could, for they are not shadowy phantoms of a vain imagination, but possess an inner necessity and truth. Goethe’s words resonate for Rothwell who has a deep interest in hybridity, biomimicry and biotechnology. Her Urpflanze works on canvas are sinister, exuberant ‘uberweeds’. Each one is a fantastic conflation of a group of weeds from a single location. In this series each location is a particular street. Plants track our movements. Wherever we go, weeds follow. A weed is only a misplaced plant. ‘Weed’ is a human construct. And yet of course, people’s coming and goings often have disastrous consequences. Where recent Urpflanze works used military camouflage fabrics as the substrate (each fabric carefully sourced to reflect the country of the collected weed species) in Borderlands Rothwell uses black thread on raw canvas. The reality that invasion and battle are inextricably linked is underscored here by Urpflanze street plant #6 (Tarin Kot, Camp Holland, Diesel Farm Road, Afghanistan, collected by Ben Quilty, 171000 stitches 28.12.2011) 2012. The weeds that are the source for this work were gathered by the artist’s friend, painter Ben Quilty, during his assignment in Afghanistan as official war artist. Rothwell’s idiosyncratic approach to mapping sites finds a different manifestation in the Murray/Darling drawings and the Murray/Darling Vista 2012. These works identify localities by a dual strategy of medium and content. The Britannia metal works in the sculptural tableau Attendants, recall earlier sculptures such as Transmutation (2010) and Comparative anatomy series (2009). Like these, Attendants refers to an early Renaissance work on paper, however this is the first time Caroline Rothwell’s source material has been religious in content. She says Martin Schongauer’s engraving The Temptation of St Anthony (c.1480-1490) has been a key work for her but she has ‘always resisted the impulse to work with it’. 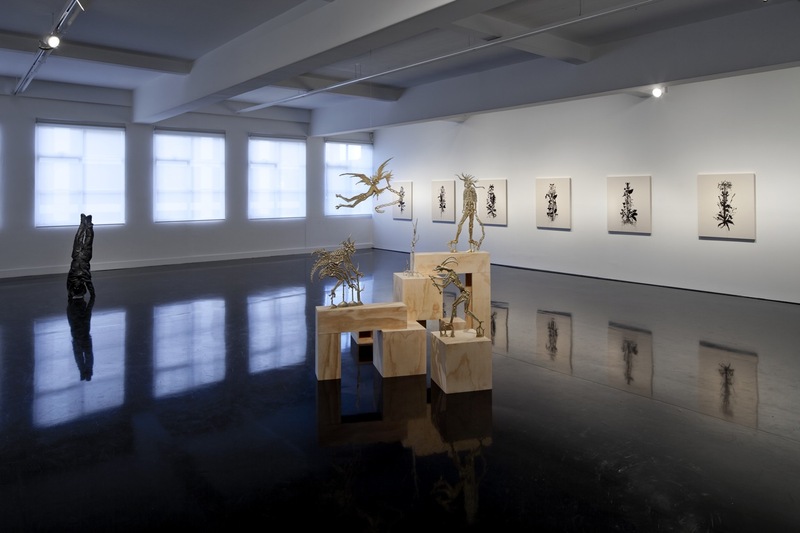 Rothwell has located three demonic figures, three skeletal trees and one suspended figure around a basic set of plinths of varying heights creating ‘a plywood topography’. Rothwell’s usual treatment for her Britannia metal sculptures has been to finish them in either nickel plate or auto lacquer but here the material has been left raw, its silvery patination shifting from oyster to tea-stained tones. The raw look of Attendants enhances the menace of the subject. Saint Anthony may be absent but his tormentors are unleashed to become potent symbols for anguish of all forms – from the personal to the global. The bronze Handstanding Youngster reminds us of Rothwell’s contrary world-view. While Attendants conjures profound and frightening misery, this life size sculpture of an agile child in upended pose is more playful. Wearing the uniform of the Western world, the ‘hoodie’, the figure’s hair is styled into plaits but the face is not wholly human, instead its eyes and mouth are modeled from a stingray. The subtle mutation of Caroline Rothfield’s ‘outsider’ character functions both as a humanist symbol of difference and as a signifier of environmental instability. Handstanding Youngster is a companion to Youngster (2011). The pair wear identical outfits, the lining of their hoods and sleeves are coated with bronze casts of Australian minerals, quartz and coal. In keeping with her interspecies development, Handstanding Youngster’s hood, jacket band, trouser cuffs and pockets boast more crystals. For Rothwell these surreal interventions reflect both Australia’s national economy (fragile both in human and environmental terms) and our contemporary quasi-spiritual crystal culture. Both Youngsters stand within the trajectory of monumental bronze sculpture from ancient classical sculpture to Rodin. As well, Rothwell sees Handstanding Youngster’s scuffed shoes as a quiet homage to some of her favourite works by Vincent Van Gogh, his paintings of shoes (1886-88). Any serious reading of Caroline Rothwell’s oeuvre must consider her erudite relationship not only to science but to her chosen profession. For instance, she informed me that Schongauer’s Torment of Saint Anthony has influenced numerous artists and cited several works by English duo the Chapman Brothers, as well as a painting made by Renaissance giant Michelangelo as a child. Reshuffling traditional genres and playing with media are persistent back-stories in Rothwell’s world. Her use of such ‘low’ art form media as vinyl and machine sewing is highly considered. She uses the former in the surrealistic Murray/Darling Vista, a major landscape rendered in a contemporary industrial signage idiom. She wants us to note her process. She has left the ‘cut-and-paste’ marks of her Photoshop technique clearly visible. Similarly obvious are the threads left by the machinists who embroidered the Urpflanze works. With feminist intensity Rothwell reminds us of the tradition of ladylike accomplishments. The botanical specimens of Murray/Darling drawings also suggest feminine arts but what lady would touch the gunk found in a car exhaust? It is a mark of Caroline Rothwell’s prowess that this exhibition, typically diverse in media, style and subject presents as powerfully cohesive. Rothwell’s is a relentlessly conceptual practice; her ruminations on the environmental state of play and the bumbling consequences of human ‘progress’ are undercut with humour and even optimism. The demonic Attendants are frightening but they are also absurd. The Urpflanze works are threatening but ebullient. Rothwell’s inventive world provides us with complex reflections of our anxieties; this sophisticated multi-dimensionality accounts for her capacity to comfort while she frightens us. The demonic ‘other’, as configured by Caroline Rothwell, endears itself to us even while we recoil. Unless otherwise indicated, all artist quotes are from conversations with the author, August-September 2012. Ben Quilty was attached to the Australian Defence Force 11 October – 3 November 2011, observing activities in Kabul, Kandahar and Tarin Kot. An edition of Handstanding Youngster and Youngster will be exhibited in historic Barrack St, Sydney from 21st September 2012. The sculptures have been curated by Vi Girgis and Adam Porter as part of the City of Sydney’s George Street project.